It was almost a year to the day. 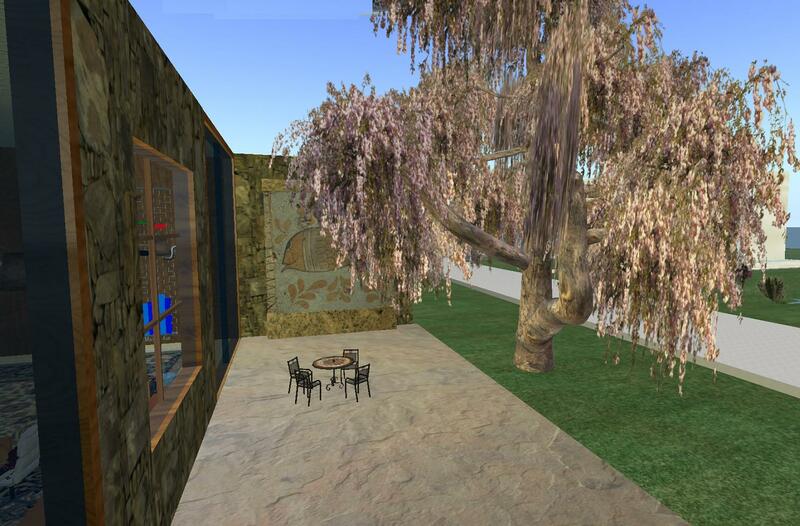 September 2008 I threw myself under the bus – I volunteered to make trees for a conference inworld. Remember? It changed my life. It was perhaps one of the smartest things I have ever done in my life. I was thrilled. J put me on the team to build the sims for this year’s conference. LOL – oh YEAH – she wants TREES again. ROFL. OMG. I don’t think that I can count on Honour to pull me out of the fire THIS year. Actually, J is encouraging me to do more than plant trees and plants. She is encouraging me to learn to build more, do more. Build fountains. Write the scripts for various objects (sitting, etc.). Basically she is doing all that a mentor should do. In the meantime, my brain is spinning all the time about landscaping, textures, builds, what to do. I walk around with my camera taking pictures of botanical gardens, rock walls, brick walls, wood benches. I am looking for ideas. I am looking for textures. Honour has promised to give me a day and try to teach me about sculpties and textures and things like that. I covet her weeping willow trees. *grin* I have soooo much to learn. I don’t even know if I can turn my photos into textures – that will be part of my learning. I have a growing list of what I NEEEEEEEEEEEEEED. LOL. Bamboo trees. Ornamental grasses. Better flower textures. 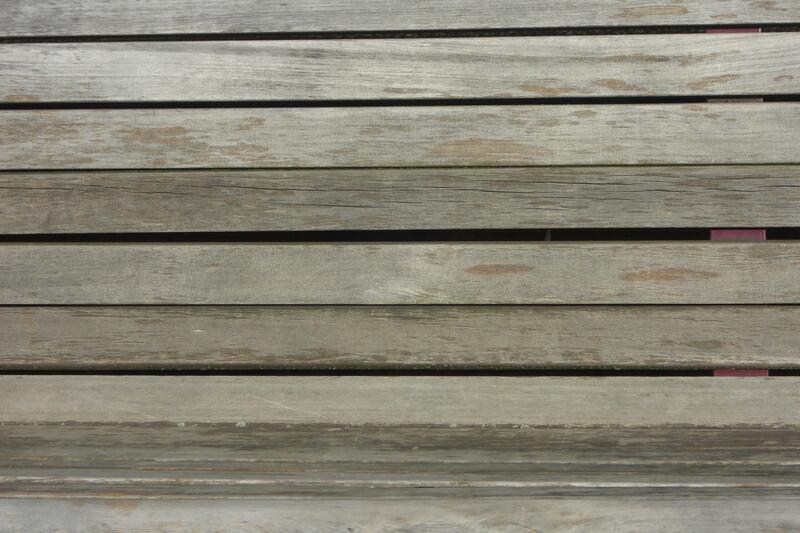 Graceful wood benches. I’m not even going to tell you about the conversation J and I had about sculpture and art. Sigh. That will be another post. Oh yeah, what a surprise. LOL. We butted heads already. *grin* I think Honour is running a pool about how long it will be before I try to “do in” J. You may want to contact Honour if you want in on that. But you know what? I AM going to do this. I figure for the next 5 weeks, my life belongs to this project. No social time, no sleep. Oh gee – sounds like last year. But I am not going to be the weak link. The view from under the bus can be a very triumphant view. Sometimes I am amazed at how difficult it is to communicate in this world. I don’t mean technologically. I don’t mean language barriers. I don’t even mean that we give words different connotations. Sometimes – we can’t communicate because the event the one person describes is not in the reality of the listener. I have a demo in 45 minutes (less, by the time I finish posting this). I have a bug in my script. I’m saying something two times instead of once. It’s a list of names. I spent nearly 4 hours this morning talking to some really, REALLY smart people about my bug. They kept asking me questions that just seemed crazy to me. I thought I’d explained the process I was scripting. I thought it was incredibly obvious. I didn’t understand WHAT was so difficult. The more I tried to say I am trying to do these steps, the farther apart we seemed to grow. So. Here we go…..
1. Avatar walks up to the signin desk. 2. Avatar touches the poseball. 3. Animation takes over, avatar is signing name. 4. Script is sensing all other avatars around the avatar signing in. Because the one avatar is signing in ALL the other avatars (co-workers) standing about. Don’t argue yet. That’s what my manager requested. Keep reading. 5. Script shouts the list of names (avatar signing in AND all other around) to a Welcome Board in another room. 6. Welcome Board displays list of names. 8. Avatar that was signing in is teleported to the other room with the Welcome Board. 9. Avatars that are left in first room must each click the teleporter device to tp to 2nd room. My scripting friends could not envision a scenario where one person would sign-in another person. I am totally blown away. I do this all the time. Two of us walk up to a sign-in desk. If I pick up the pen, I’m going to sign your name, too. If you pick up the pen – I expect you to sign me in. Sure – if we’re talking badges and security – we each sign ourselves. But talking a casual kind of demo/meeting, where the point is simply to see who came in??? For heaven’s sake – you’re standing there – sign my name! No. I had TWO people look at me/ IM me and say “personal integrity”. You have got to be kidding me. I asked more people. Nope, they’d NEVER sign in someone else. So I guess that makes my manager and I and one co-worker and one SL friend the only people in the universe who would sign-in someone else so that they didn’t have to be bothered. Tell me. Honestly. Would you sign me in? Some weeks I have nothing much new or interesting to report about my life. Other weeks – I can’t catch my breath. This past week was breathless. Since I’ve become a bit sporadic about posting, I figured I’d get these snippets up while they were still fresh in my mind, giving me joy. Shengri La turned 3 years old recently so a great deal of my week was involved with that. That will all figure in the next post. But there were a few other things happening as well. One of the best things that happened this week was a reunion. I didn’t post on it here, but Dale posted on his blog. He had to leave his shack at Pier. That was my first home. Literally. When Dale rescued me from Orientation Island, SL set Pier to my home location. And it stayed my home until I finally moved here to McIntyre. If you go back to my posts on my first hours in SL, I’m sure that I mentioned the wonderful black kitty that lived on Dale’s couch at Pier. I LOVE Kitty. Kitty was my best friend on many an occasion. I’d go hang out with Kitty, model my new outfits for him, feed him tuna snacks (oh does Kitty have fish breath sometimes!!!). I’d cuddle Kitty and we’d confide in each other. And then… Pier was no more. Kitty was locked away in inventory. A little piece of my heart was broken when Dale and Kitty left Pier. But we were reunited this week. 🙂 After a party Dale and I went back to visit Kitty, and see his new home. Oh joy!!! We sat forever, talking and relaxing and loving Kitty. 🙂 It was heaven. It’s not Pier, but it was still Home. Ah Kitty – *hugs* I love you. /me fills back with tuna treats and marks calendar for next visit. And there is the great Mainland is Ugly propaganda. Well, I live on the mainland. Yeah, my next-door neighbors put up a landing strip. You know what – it has never bothered me. THEY have never bothered me. Almost nothing that happens around my house has bothered me. Until this week. Finally a neighbor did something that I did indeed find not to my taste. I like to sit by my pool, at my table with my laptop, drinking coffee while I work or blog (as I am doing now). The other morning I sat down, looked up across the way, and there was a large revolving religious symbol. Very large. Very obvious. As close to my property line as they could put it without going over the line. It actually was brushing against some of my tree branches. So I stared at that a bit. Decided that I really did NOT want to see it anymore. They were entitled to their opinion, but having seen it, I didn’t need a constant reminder. So I put up a thicket hedge. 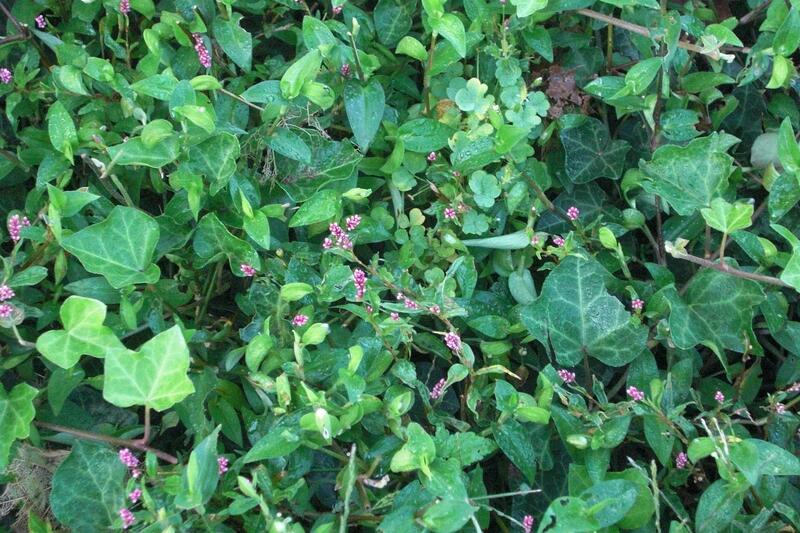 Shenlei had given me this particular hedge when I moved in – she used it to block an ad farm near the back of my property. So I tossed the tree that was there, put up the thicket and there you go. Problem solved. I guess us Mainlanders are pretty flexible folks. Wow. I didn’t think I had anything to say, but I went on and on, didn’t I? That’s because this will have to hold you through the week. It’s Pesach, and RL takes precedence this week. Two of my favorite bloggers have touched upon one of my favorite topics: appearances in a virtual world. I blogged about this waaaaaay back in my truly early days, when I asked Is a Virtual World a Good Thing? (July 7, 2008) The true irony is that in THAT post I was whining about not wanting to fuss about details such as my hair, skin, etc. Well, well, well, how things have changed, no? By the way – this first picture…. that is me. Changed. I made that brown hair. 🙂 That’s the truth. I was born into SL. There is so much free content here that allows you to customize your avatar. Without much effort you can change your hair, your skin, your walk, your sit, your clothes, your shape, your gender, your fur, your wings, your tentacles…. I think you understand. Even more to the point – you have some very good choices for default avatars. As I watch newbies coming through the gateway, wearing MY original avatar, I am still impressed by what a relatively good avatar that is. Yes – I STILL like the hair. But I’ve been working in Opensim a LOT lately. I have become such an appearance snob that when I had to create an avatar in OS I refused to use my name. I vowed that Ahuva Heliosense had a reputation to maintain and she would NOT be found in OS until her boots, hair and AO were there with her. 🙂 Aren’t I totally ridiculous??? But I mean it – if you see what her poor sister Summer looks like – omg – what a real dweeb. And she walks like a complete and utter newb. Barefoot. I absolutely cannot stand how Summer looks (sorry, Hon, but you really are somewhat of an embarrassment). Because I can’t stand watching Summer, I really do not enjoy my time in Opensim as much as I could. The appearance detracts from the experience and I do NOT go there as often as I should/could. Let me mention again the Stanford Study (research done in 2006 by Nick Yee. ) and its conclusions about avatar appearance on the real-life person. I am not unique. Although the techies with whom I associate don’t seem to be as perturbed by their appearances as I, most of the world are not techies. *grin* Honest – that’s the truth. Corporations who are trying to do business in virtual worlds need to understand that appearances matter, realism matters. If the users are not enjoying the experience – it’s going to fail. The avatars need to look good, move well, and have textured, well-made content. As Honour would say – textures are the foundation for SL. 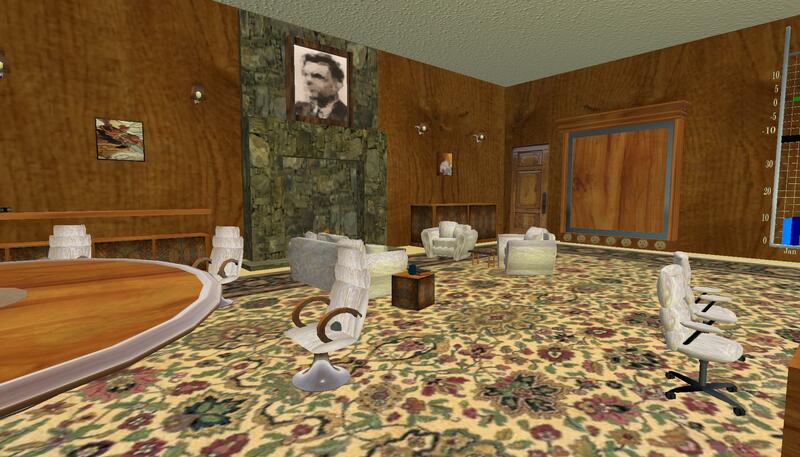 If the content does not have good textures – no one is going to enjoy the view. And if the customers don’t like the view – THEY LEAVE. There is a continuum of life-like appearance. Back in July I found Ariane Barnes and her post on the Uncanny Valley. Prad Prathivi is talking about the Uncanny Valley also. Prad mentions his own reaction to life-like avatars and how the reaction changes. Someone offered to take a RL picture of me and make my avatar look like me. THAT life-like I don’t want. But I have colleagues that DO want that. The continuum will be different for each of us. We need the ability to customize our avatars ourselves, easily, in order to make the virtual world a world that fits OUR needs. 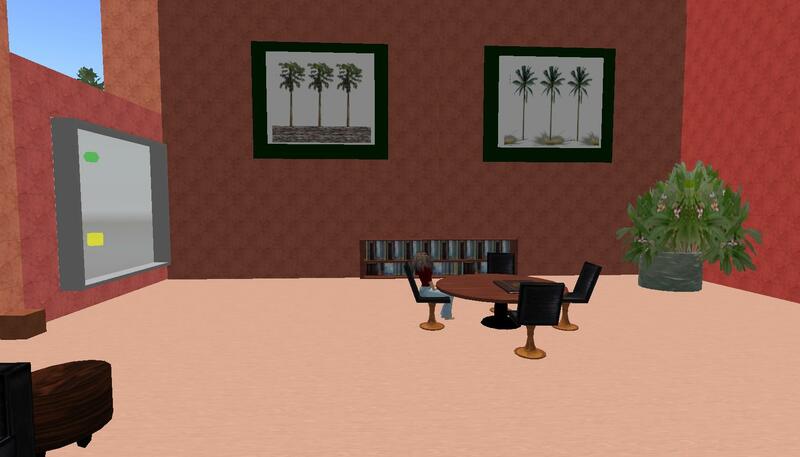 Shenlei Flasheart is writing about Business-to-Consumer corporations (B2C) moving into virtual worlds. Fashion Research Institute has been contacted by corporations wishing to provide contact to their virtual world employees. Unfortunately, most of the people driving the projects for these corporations have no idea of what is involved to provide good, realistic content. Apparently they do not budget for that and are stunned when someone gives them a realistic estimate of the time and effort involved (read: “cost”) to produce content that will satisfy their employees. If the employees think that they look like unattractive, stiff dweebs – the employees are NOT going to participate wholly and the project will FAIL. Several friends have pointed out the case study that LL has posted on the SL blogs. 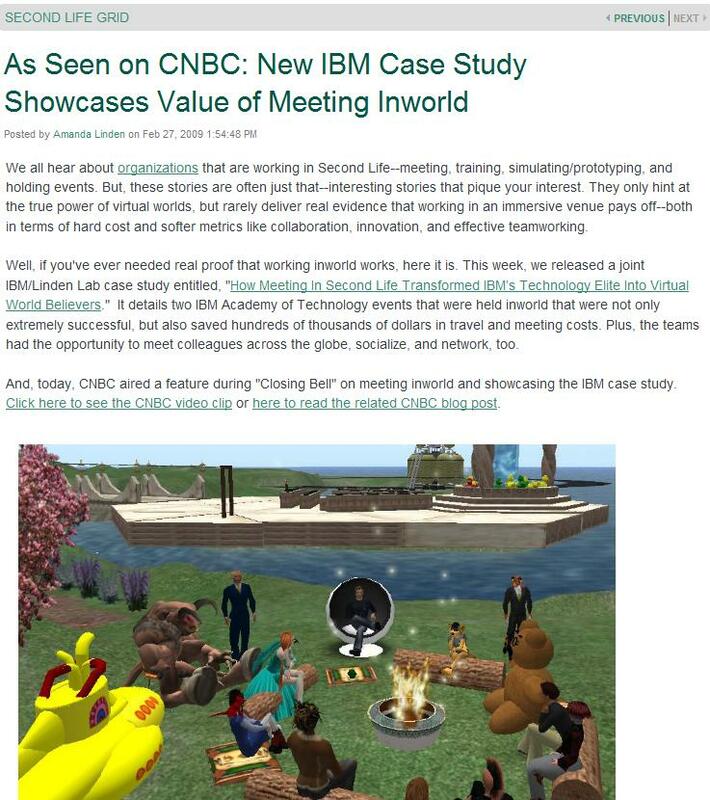 This case study shows how IBM “got it” about making the employee experience a good one. Which means that it was a SUCCESSFUL experience and IBM benefited. If they can “get it” – let’s hope other companies can as well. I sure hope someone is listening out there. Could I see you in my office a moment? 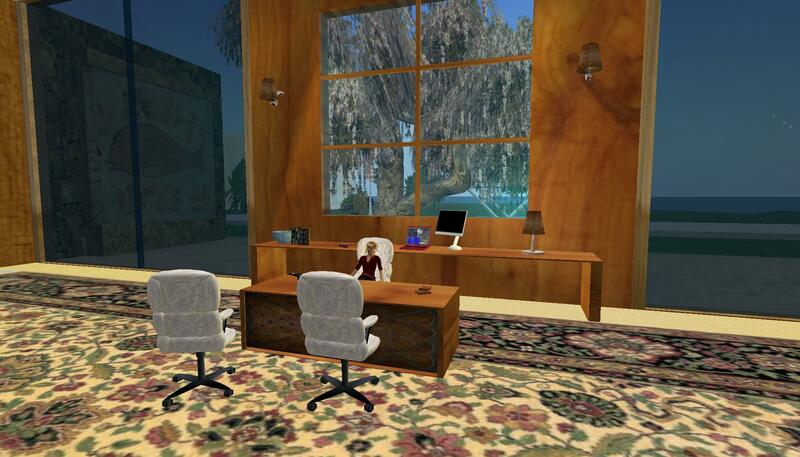 I have been posting about my RL work that I do in SL. I can’t talk about most of it, of course. Work is work, after all. But I CAN show you where some of it takes place. 🙂 I am fortunate to be friends with a wonderful person who is a great builder as well. Since I did not get her permission first, I won’t post her name, but she should feel free to claim the credit in a comment. She built me this beautiful office. I was going crazy with project specifications, scripting details, coordination of efforts, scheduling and the like. I said: “I NEED an office.” Now had I told this person that I NEEDED more boots, or that I NEEDED another AO or skin, she’d have laughed in my face. But she understood that in this case NEED really was NEED. So she built me this gorgeous executive office. This office is MINE until such time as my manager steps in and claims it for himself. Sigh. But I have it for awhile longer. Note the gorgeous outdoor landscaping. Many of you remember the famous tree escapade. I see you all rolling your eyes and looking for the nearest exit. Relax. Calm down. I’m only going to remind you that I slaved and labored and toiled and broke every fingernail I had planting flowers and bushes for days, only to be asked at the last minute by that project coordinator to pull them all and redo the gardens completely with fewer prims and fewer unique flowers. Oh yeah – in less than 24 hours, too. Well. The same person owns the land upon which my office sits. But my landscaping STAYS this time!!! No one can touch it! Because I am listed as owner now and it’s my parcel. So the flowers and the tree and the waterfall STAY. Hah! Ah yes, I have a wonderful outdoor patio with a waterfall to provide soothing sounds while I take refreshment under the weeping cherry. Beautiful flowers climbing the terrace. Yes, I do have neighbors. Even more awkward – I am near the central landing spot for the sim. Sigh. It would have been nice if SOMEONE had mentioned that to me when I said that I thought this parcel would do. I know – I should simply be quiet and be grateful I got this parcel. Still….. I don’t mind people coming by and walking in. 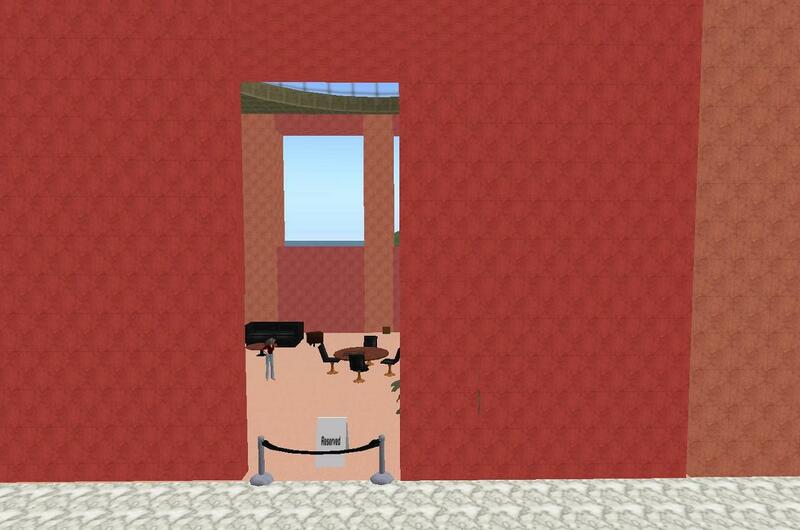 What annoys me is that they don’t close the door behind themselves. 🙂 Come in, look around, sit down. But please close the door!!!! Every time I’ve tp’d back to the office this week, at least one door is open. So the inside is quite luxurious. I still need to fix the poseballs in the guest chairs at my desk. *grin* Otherwise my guests will fall asleep. I have a huge conference table for meetings. A couch and comfy chairs for more informal occasions. A slide projector. So for my first presentation I put on a suit and all, looked quite, sigh, dull. For the second presentation, I went back to being myself. *grin* jeans, boots and a sweater. I did put my hair up, however, since even in RL I will pull back my unruly mop when I am doing presentations. So here is my office sweet office. I love it. I intend to enjoy every moment of executive privilege til my manager takes my offfice away. Feel free to drop in and visit. Office hours are M-F, 9-5. See you soon! You know that Shenlei and I are good friends in SL. What you may not know is that now we are good friends outside of SL. 🙂 In the atomic world, Shen is CEO of Fashion Research Institute, Inc. Shenlei has invested much effort into Opensim. This week she announced a major enhancement that will bring joy to residents of virtual worlds – the creation of the Message Bridge. The technical announcement can be found at Open Simulator Forge. The Message Bridge is simple. One simple chatted command, and I’m connected to colleagues and friends in Second Life without breaking immersion in OpenSim. 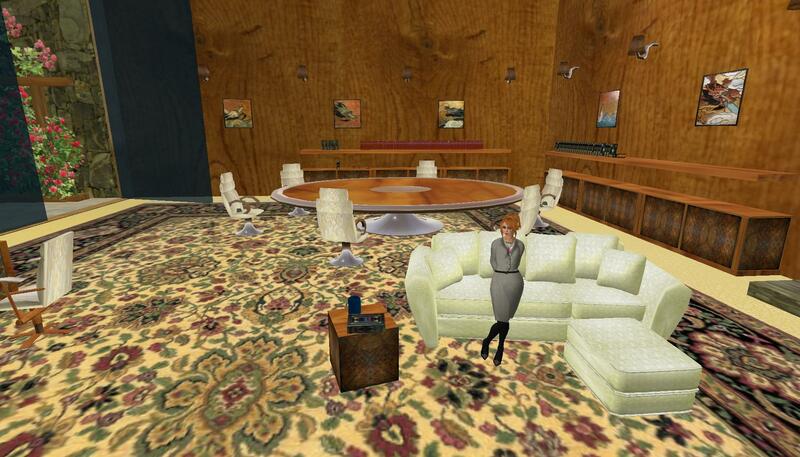 I can stay in touch, handle issues as they arise, and remain safely tucked away in our OpenSim doing real work. 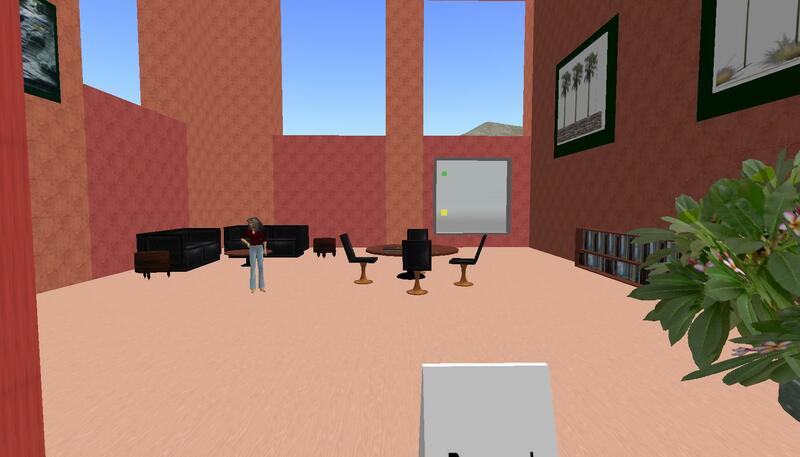 It’s a small advance in technology, but a huge social advance for people doing real work in OpenSim. 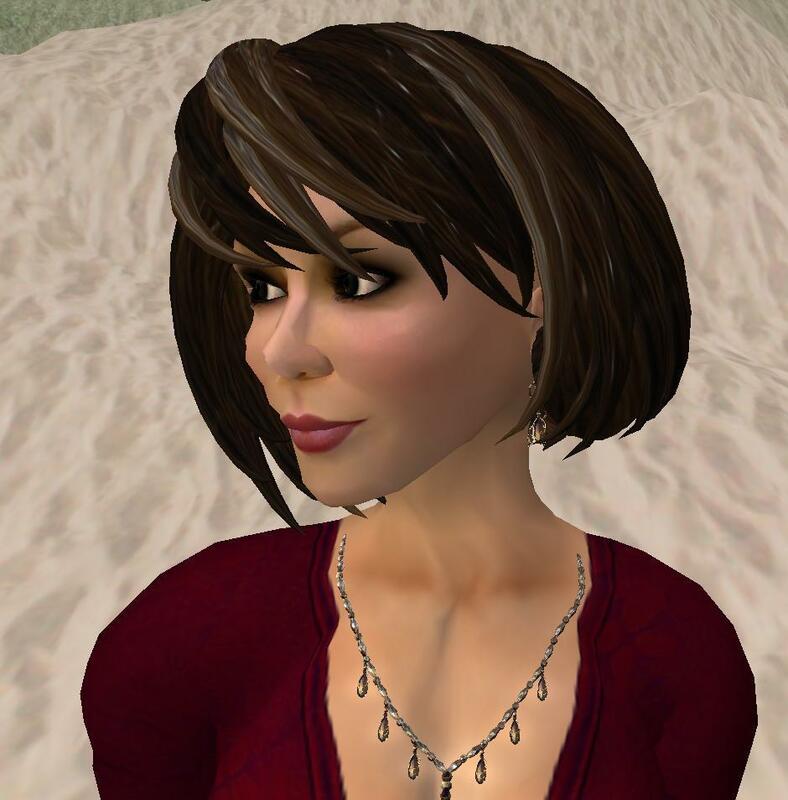 People who are working in OpenSim usually have roots in Second Life, and are likely to have business contacts and actual business in Second Life as well. It is a matter of business productivity and quality of the work environment that the two populations can communicate through messaging without breaking immersion. It’s not teleporting, it’s not asset sharing, but it is a critical component to supporting actual workers doing actual work in these virtual worlds. It lowers the barriers to doing business across worlds. 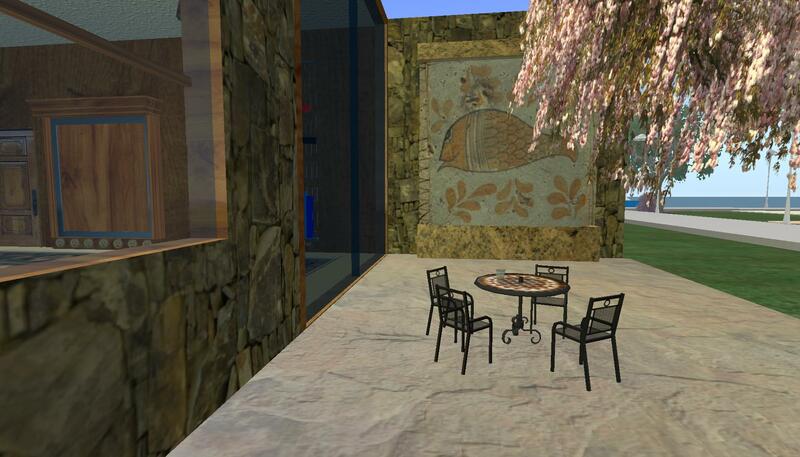 So here is the proof folks: You can see Shenle in her opensim grid chatting with me working away in SL. Same chat, different worlds. Notice that while my chat box is the old familiar SL look, Shen’s chat identifies the grid for each user. 🙂 You gotta love it.